CAN IRON DARKEN THE BABY? No, it cannot, but the belief runs deep across the rural pockets of our country and in cities, too. This is probably because iron tablets are dark brown or black in colour, and its regular consumption leads to black stools. Such a strongly held albeit baseless belief makes many women shun the mineral during their pregnancy. This is most unfortunate, because while expecting, the blood volume goes up by 1-1.5 litres for the growing demands made by the baby and your body. So we need to supply our body with extra iron from diet or, if the situation requires, through medicines. Iron absorption from diet or supplements is, however, not a straightforward process. Dietary iron can come from both heme (animal meat) and non heme sources (such as greens, lentils and beans). While iron from heme sources is readily absorbed by the body, non heme sources are not efficiently used up. To a certain extent, taking vitamin C along with iron aids better absorption. Say, if you were to squeeze lemon over your palak paneer, the iron in the greens gets used up. Iron pills, if prescribed by the doctor, must be taken because most Indian women have below average haemoglobin levels. Add to this the reduced accessibility to balanced, nutritional diet and we are nowhere near providing the required amount of iron for our expanding bodies and babies. Any reservation that you might have about the leaching effects of iron tablets can be dismissed by understanding that the colour added to these tablets or capsules are food grade and generally added by drug manufacturers to attract and influence consumer decision. This is why vitamin C tablets, found in most fruits, are usually orange and calcium tablets white. Colour in pills also helps protect its contents from UV rays and sunlight. Opaque coverings also increase stability and decrease release of free radicals inside the capsule. Moreover, the outer casing of tablets is made from gelatin, which is derived from animal skin or bones. This dissolves the moment it reaches your stomach. Casings are also derived from non-animal sources that are water soluble. 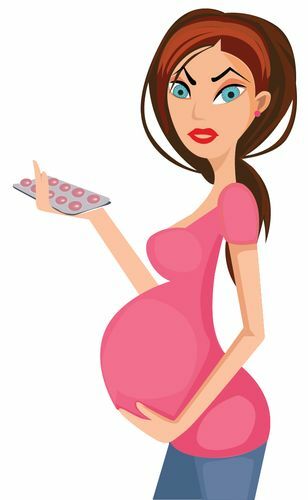 To sum up, go for iron during pregnancy in a dosage that the doctor prescribes. Be prepared for it to be tinkered during the nine months. Once iron levels are stabilised, your doctor may discontinue the tablets. However, during the fag end of the last trimester, blood count can dip again and supplements will have to resume. Next Issue: Eclipses—to hide or watch? * Excess consumption of iron can lead to diarrhoea or constipation. During pregnancy, its dosage will therefore be tinkered carefully with the help of blood tests.